To mark their territory, hippos spin their tails while defecating to distribute their excrement over the greatest possible area. Most of the hippos defecation occurs in the water, creating deposits of organic matter along the river beds. It is not clear what the ecological function of these deposits are. They also pee backwards, and are known as retromingent animals. You would think that since hippos are always in the water, they wouldn’t be so dirty. Hippos aren’t always in the water, but it’s true that they’re relatively clean animals. They don’t wallow in the mud like their close relative, the pig. What you see on the walls of the hippo cage isn’t mud, it’s poop. Dominant male hippopotamuses mark their territory by flinging poop with a distinctive finesse, even in captivity. It’s an interesting thing to observe, their tails start wildly paddling back and forth as they defecate. This messy behavior is delicately labeled “dung showering” by those who study hippos. People standing nearby, however, call it something else entirely. 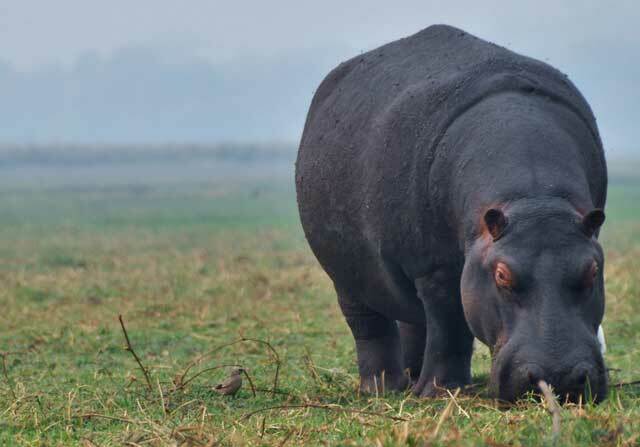 Hippos produce almost as much poop daily as an elephant. Blood, Sweat, and Well, Other Things. How Much Poop Does an Adult Human Produce Each Day Per Pound of Food Eaten and What Is Poop Made of?